A machine is a thing that is created by people to make work easier. Some machines have many parts that move. Examples are bicycles and clocks. Some machines do not have parts that move. Examples are computers and telephones. People have used machines since before there was history. Often a machine will change one form of energy to another form of energy. Simple machines increase or change the direction of a force. The hand axe, made by chipping flint to form a wedge, in the hands of a human transforms force and movement of the tool into a transverse splitting forces and movement of the workpiece. The idea of a simple machine originated with the Greek philosopher Archimedes around the 3rd century BC, who studied the Archimedean simple machines: lever, pulley, and screw. 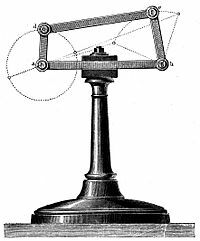 Archimedes discovered the principle of mechanical advantage in the lever. 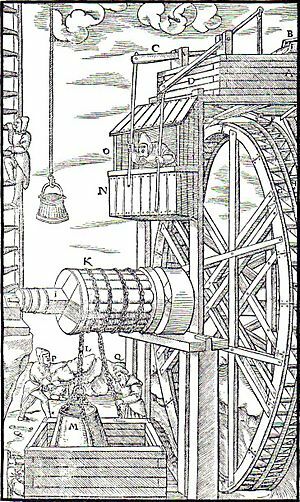 Later Greek philosophers defined the classic five simple machines (excluding the inclined plane) and were able to roughly calculate their mechanical advantage. Heron of Alexandria (ca. 10–75 AD) in his work Mechanics lists five mechanisms that can "set a load in motion"; lever, windlass, pulley, wedge, and screw, and describes their fabrication and uses. However, the Greeks' understanding was limited to statics (the balance of forces) and did not include dynamics (the tradeoff between force and distance) or the concept of work. During the Renaissance the dynamics of the Mechanical Powers, as the simple machines were called, began to be studied from the standpoint of how much useful work they could perform, leading eventually to the new concept of mechanical work. In 1586 Flemish engineer Simon Stevin derived the mechanical advantage of the inclined plane, and it was included with the other simple machines. The complete dynamic theory of simple machines was worked out by Italian scientist Galileo Galilei in 1600 in Le Meccaniche ("On Mechanics"). He was the first to understand that simple machines do not create energy, they merely transform it. 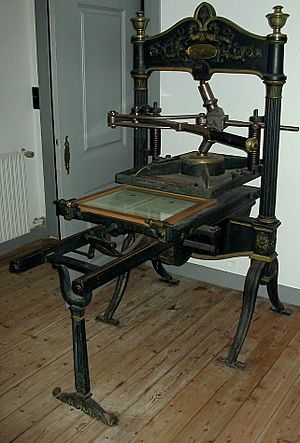 The classic rules of sliding friction in machines were discovered by Leonardo da Vinci (1452–1519), but remained unpublished in his notebooks. They were rediscovered by Guillaume Amontons (1699) and were further developed by Charles-Augustin de Coulomb (1785). 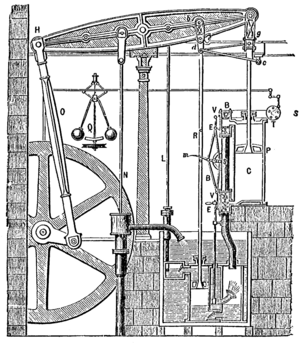 James Watt patented his parallel motion linkage in 1782, which made the double acting steam engine practical. The Boulton and Watt steam engine and later designs powered steam locomotives, steam ships, and factories. Starting in the later part of the 18th century, there began a transition in parts of Great Britain's previously manual labour and draft-animal–based economy towards machine-based manufacturing. It started with the mechanisation of the textile industries, the development of iron-making techniques and the increased use of refined coal. 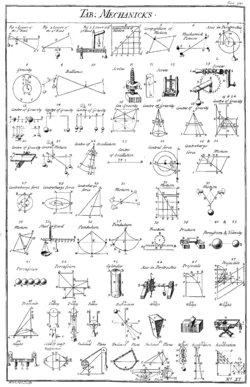 Table of simple mechanisms, from Chambers' Cyclopædia, 1728. Simple machines provide a "vocabulary" for understanding more complex machines. The idea that a machine can be decomposed into simple movable elements led Archimedes to define the lever, pulley and screw as simple machines. By the time of the Renaissance this list increased to include the wheel and axle, wedge and inclined plane. The modern approach to characterizing machines focusses on the components that allow movement, known as joints. Wedge (hand axe): Perhaps the first example of a device designed to manage power is the hand axe, also see biface and Olorgesailie. A hand axe is made by chipping stone, generally flint, to form a bifacial edge, or wedge. A wedge is a simple machine that transforms lateral force and movement of the tool into a transverse splitting force and movement of the workpiece. The available power is limited by the effort of the person using the tool, but because power is the product of force and movement, the wedge amplifies the force by reducing the movement. This amplification, or mechanical advantage is the ratio of the input speed to output speed. For a wedge this is given by 1/tanα, where α is the tip angle. The faces of a wedge are modeled as straight lines to form a sliding or prismatic joint. Lever: The lever is another important and simple device for managing power. This is a body that pivots on a fulcrum. Because the velocity of a point farther from the pivot is greater than the velocity of a point near the pivot, forces applied far from the pivot are amplified near the pivot by the associated decrease in speed. If a is the distance from the pivot to the point where the input force is applied and b is the distance to the point where the output force is applied, then a/b is the mechanical advantage of the lever. The fulcrum of a lever is modeled as a hinged or revolute joint. Wheel: The wheel is clearly an important early machine, such as the chariot. A wheel uses the law of the lever to reduce the force needed to overcome friction when pulling a load. To see this notice that the friction associated with pulling a load on the ground is approximately the same as the friction in a simple bearing that supports the load on the axle of a wheel. However, the wheel forms a lever that magnifies the pulling force so that it overcomes the frictional resistance in the bearing. The classification of simple machines to provide a strategy for the design of new machines was developed by Franz Reuleaux, who collected and studied over 800 elementary machines. He recognized that the classical simple machines can be separated into the lever, pulley and wheel and axle that are formed by a body rotating about a hinge, and the inclined plane, wedge and screw that are similarly a block sliding on a flat surface. Simple machines are elementary examples of kinematic chains or linkages that are used to model mechanical systems ranging from the steam engine to robot manipulators. The bearings that form the fulcrum of a lever and that allow the wheel and axle and pulleys to rotate are examples of a kinematic pair called a hinged joint. Similarly, the flat surface of an inclined plane and wedge are examples of the kinematic pair called a sliding joint. The screw is usually identified as its own kinematic pair called a helical joint. This realization shows that it is the joints, or the connections that provide movement, that are the primary elements of a machine. Starting with four types of joints, the rotary joint, sliding joint, cam joint and gear joint, and related connections such as cables and belts, it is possible to understand a machine as an assembly of solid parts that connect these joints called a mechanism . Two levers, or cranks, are combined into a planar four-bar linkage by attaching a link that connects the output of one crank to the input of another. Additional links can be attached to form a six-bar linkage or in series to form a robot. Modern machines are systems consisting of (i) a power source and actuators that generate forces and movement, (ii) a system of mechanisms that shape the actuator input to achieve a specific application of output forces and movement, (iii) a controller with sensors that compare the output to a performance goal and then directs the actuator input, and (iv) an interface to an operator consisting of levers, switches, and displays. This can be seen in Watt's steam engine (see the illustration) in which the power is provided by steam expanding to drive the piston. The walking beam, coupler and crank transform the linear movement of the piston into rotation of the output pulley. Finally, the pulley rotation drives the flyball governor which controls the valve for the steam input to the piston cylinder. Power flow through a machine provides a way to understand the performance of devices ranging from levers and gear trains to automobiles and robotic systems. The German mechanician Franz Reuleaux wrote, "a machine is a combination of resistant bodies so arranged that by their means the mechanical forces of nature can be compelled to do work accompanied by certain determinate motion." Notice that forces and motion combine to define power. More recently, Uicker et al. stated that a machine is "a device for applying power or changing its direction." McCarthy and Soh describe a machine as a system that "generally consists of a power source and a mechanism for the controlled use of this power." Human and animal effort were the original power sources for early machines. Natural forces such as wind and water powered larger mechanical systems. Waterwheel: Waterwheels appeared around the world around 300 BC to use flowing water to generate rotary motion, which was applied to milling grain, and powering lumber, machining and textile operations. Modern water turbines use water flowing through a dam to drive an electric generator. Windmill: Early windmills captured wind power to generate rotary motion for milling operations. Modern wind turbines also drives a generator. This electricity in turn is used to drive motors forming the actuators of mechanical systems. Engine: The word engine derives from "ingenuity" and originally referred to contrivances that may or may not be physical devices. See Merriam-Webster's definition of engine. A steam engine uses heat to boil water contained in a pressure vessel; the expanding steam drives a piston or a turbine. This principle can be seen in the aeolipile of Hero of Alexandria. This is called an external combustion engine. An automobile engine is called an internal combustion engine because it burns fuel (an exothermic chemical reaction) inside a cylinder and uses the expanding gases to drive a piston. A jet engine uses a turbine to compress air which is burned with fuel so that it expands through a nozzle to provide thrust to an aircraft, and so is also an "internal combustion engine." Power plant: The heat from coal and natural gas combustion in a boiler generates steam that drives a steam turbine to rotate an electric generator. A nuclear power plant uses heat from a nuclear reactor to generate steam and electric power. This power is distributed through a network of transmission lines for industrial and individual use. Motors: Electric motors use either AC or DC electric current to generate rotational movement. Electric servomotors are the actuators for mechanical systems ranging from robotic systems to modern aircraft. Fluid Power: Hydraulic and pneumatic systems use electrically driven pumps to drive water or air respectively into cylinders to power linear movement. The mechanism of a mechanical system is assembled from components called machine elements. These elements provide structure for the system and control its movement. The structural components are, generally, the frame members, bearings, splines, springs, seals, fasteners and covers. The shape, texture and color of covers provide a styling and operational interface between the mechanical system and its users. The assemblies that control movement are also called "mechanisms." Mechanisms are generally classified as gears and gear trains, which includes belt drives and chain drives, cam and follower mechanisms, and linkages, though there are other special mechanisms such as clamping linkages, indexing mechanisms, escapements and friction devices such as brakes and clutches. The number of degrees of freedom of a mechanism, or its mobility, depends on the number of links and joints and the types of joints used to construct the mechanism. The general mobility of a mechanism is the difference between the unconstrained freedom of the links and the number of constraints imposed by the joints. It is described by the Chebychev-Grübler-Kutzbach criterion. A number of machine elements provide important structural functions such as the frame, bearings, splines, spring and seals. The recognition that the frame of a mechanism is an important machine element changed the name three-bar linkage into four-bar linkage. Frames are generally assembled from truss or beam elements. Bearings are components designed to manage the interface between moving elements and are the source of friction in machines. In general, bearings are designed for pure rotation or straight line movement. Splines and keys are two ways to reliably mount an axle to a wheel, pulley or gear so that torque can be transferred through the connection. Springs provides forces that can either hold components of a machine in place or acts as a suspension to support part of a machine. Seals are used between mating parts of a machine to ensure fluids, such as water, hot gases, or lubricant do not leak between the mating surfaces. Controllers combine sensors, logic, and actuators to maintain the performance of components of a machine. Perhaps the best known is the flyball governor for a steam engine. Examples of these devices range from a thermostat that as temperature rises opens a valve to cooling water to speed controllers such as the cruise control system in an automobile. The programmable logic controller replaced relays and specialized control mechanisms with a programmable computer. Servomotors that accurately position a shaft in response to an electrical command are the actuators that make robotic systems possible. Arithmometre, designed by Charles Xavier Thomas, c. 1820, for the four rules of arithmetic, manufactured 1866-1870 AD. Exhibit in the Tekniska museet, Stockholm, Sweden. Charles Babbage designed machines to tabulate logarithms and other functions in 1837. His Difference engine can be considered an advanced mechanical calculator and his Analytical Engine a forerunner of the modern computer, though none were built in Babbage's lifetime. The Arithmometer and the Comptometer are mechanical computers that are precursors to modern digital computers. Models used to study modern computers are termed State machine and Turing machine. The biological molecule myosin reacts to ATP and ADP to alternately engage with an actin filament and change its shape in a way that exerts a force, and then disengage to reset its shape, or conformation. This acts as the molecular drive that causes muscle contraction. Similarly the biological molecule kinesin has two sections that alternately engage and disengage with microtubules causing the molecule to move along the microtubule and transport vesicles within the cell. These molecules are increasingly considered to be nanomachines. Researchers have used DNA to construct nano-dimensioned four-bar linkages. A water-powered mine hoist used for raising ore. This woodblock is from De re metallica by Georg Bauer (Latinized name Georgius Agricola, ca. 1555), an early mining textbook that contains numerous drawings and descriptions of mining equipment. Mechanization or mechanisation (BE) is providing human operators with machinery that assists them with the muscular requirements of work or displaces muscular work. In some fields, mechanization includes the use of hand tools. In modern usage, such as in engineering or economics, mechanization implies machinery more complex than hand tools and would not include simple devices such as an un-geared horse or donkey mill. Devices that cause speed changes or changes to or from reciprocating to rotary motion, using means such as gears, pulleys or sheaves and belts, shafts, cams and cranks, usually are considered machines. After electrification, when most small machinery was no longer hand powered, mechanization was synonymous with motorized machines. Automation is the use of control systems and information technologies to reduce the need for human work in the production of goods and services. In the scope of industrialization, automation is a step beyond mechanization. Whereas mechanization provides human operators with machinery to assist them with the muscular requirements of work, automation greatly decreases the need for human sensory and mental requirements as well. Automation plays an increasingly important role in the world economy and in daily experience. An automaton (plural: automata or automatons) is a self-operating machine. 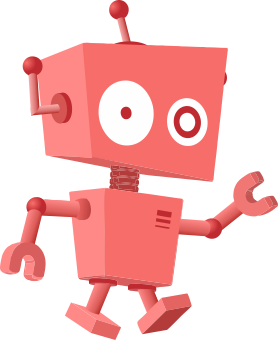 The word is sometimes used to describe a robot, more specifically an autonomous robot. A Toy Automaton was patented in 1863. Usher reports that Hero of Alexandria's treatise on Mechanics focussed on the study of lifting heavy weights. Today mechanics refers to the mathematical analysis of the forces and movement of a mechanical system, and consists of the study of the kinematics and dynamics of these systems. The dynamic analysis of machines begins with a rigid-body model to determine reactions at the bearings, at which point the elasticity effects are included. The rigid-body dynamics studies the movement of systems of interconnected bodies under the action of external forces. The assumption that the bodies are rigid, which means that they do not deform under the action of applied forces, simplifies the analysis by reducing the parameters that describe the configuration of the system to the translation and rotation of reference frames attached to each body. The dynamics of a rigid body system is defined by its equations of motion, which are derived using either Newtons laws of motion or Lagrangian mechanics. The solution of these equations of motion defines how the configuration of the system of rigid bodies changes as a function of time. The formulation and solution of rigid body dynamics is an important tool in the computer simulation of mechanical systems. The dynamic analysis of a machine requires the determination of the movement, or kinematics, of its component parts, known as kinematic analysis. The assumption that the system is an assembly of rigid components allows rotational and translational movement to be modeled mathematically as Euclidean, or rigid, transformations. This allows the position, velocity and acceleration of all points in a component to be determined from these properties for a reference point, and the angular position, angular velocity and angular acceleration of the component. recycle is the decommissioning and disposal phase and includes recovery and reuse of materials and components. Machine Facts for Kids. Kiddle Encyclopedia.